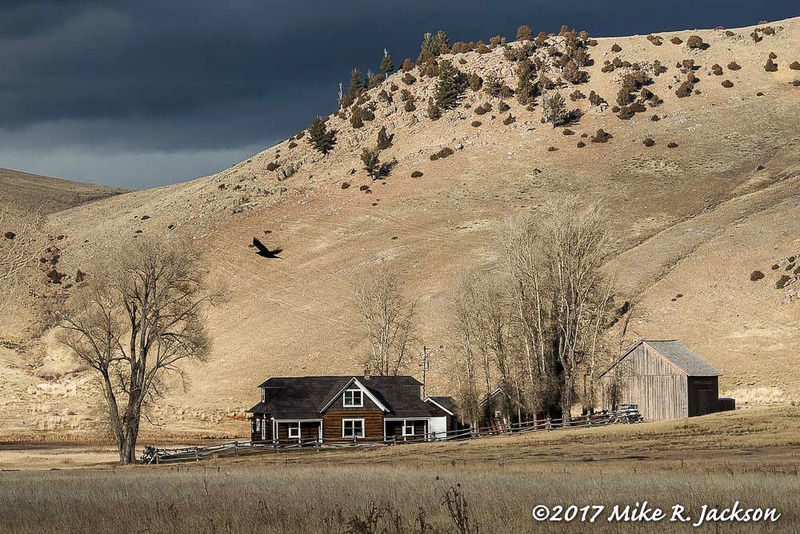 The Historic Miller House is located on the National Elk Refuge in Jackson Hole, WY. I pass by it regularly during the winter months as I drive to see the Bighorn Sheep at the base of Miller Butte. Over the years, I’ve photographed it many times. A couple of days ago, I stopped when I saw interesting light patterns beginning to develop behind the trees and structures. This page contains six of the 80 images, taken over a span of only three minutes.Signs posted along the roadway state visitors cannot stop their vehicles in the road, but Refuge officials say it is okay as long as no other vehicles are approaching in either direction. I took a series of photos out the window of my parked truck using a telephoto zoom lens at a distance of about 400 yards. I always turn off my vehicle when photographing out the window. This is the first shot taken at 2:54 PM. I would have set up a tripod if conditions were workable. It would help with consistent framing and composition across all of the shots, but there was no way I could have known the light would change enough to get this kind of variety. Furthermore, the closest parking spot was a hundred yard behind me. This event would have been long over by the time I parked and came back. Other than the raven flying through the scene and the threatening distant sky, this is a fairly boring and basic image. Continue reading "Three Moody Minutes of Changing Light"
What are you thankful for on this Thanksgiving in 2017? Everything seems to be so terrible when the news reports things. When I speak to audiences, I gently remind people that if you look with negative glasses (TV), everything looks dark and gloomy. But if you look with a perspective of abundance and blessing, things actually look pretty darned good! Continue reading "Thankful on Thanksgiving 2017"
This is my 12th year of digitally photographing Moose in the Jackson Hole area. I know I am lucky to live in an area where I get to see them on a regular basis. In fact, some of them spend the winter in our neighborhood. Photography is generally good for Moose from mid-August through the end of December when the bulls shed their antlers. This page contains photos of some of the Bulls I’ve photographed in 2017. I am positive these are not all of the bulls, but it shows a fair number and it documents the variations you might see in GTNP.Continue reading "Bull Moose: GTNP’s Boys of Fall"
Want a crystal ball to let you know what to expect in November? Check out November from last year! November 2016 Daily Journal for JH and GTNP. You should also check out this all encompassing page: Monthly Overviews for JH / GTNP. Continue reading "November 2017 Daily Journal for JH and GTNP"